We Were Soldiers is based on the book "We Were Soldiers Once... and Young" that is written by real-life war hero Colonel Hal Moore and journalist Joe Galloway who were involved the Battle of la Drang during the turbulent Vietnam war. The movie interpretation of the novel pays true homage to the original book which starts similarly to that of Saving Private Ryan as the viewer is thrown into a violent battle as the Cavalry Division of the 2nd Battalion witnesses their first glimpse of war in Vietnam. Unlike Saving Private Ryan, the film has a more earthy feel to the story and is truly grounded in realism. Mel Gibson portrays Colonel Hal Moore in the film as the tough veteran soldier who befriends journalist Joe Galloway played by Barry Pepper. Even though Galloway believed that the pen was mightier than the sword, he stood and fought with his Air Cavalry colleagues and gained the respect and understanding of Moore. Not only is the film about war but also the relationships it formed with many whom would never meet in the real world. Director Randall Wallace does an amazing job at recreating the battle scenes in the movie which are extremely realistic and violent. 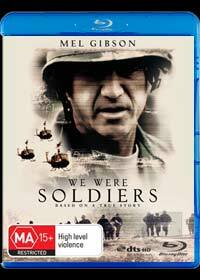 Featuring suspense, action and drama, We Were Soldiers is a visual masterpiece that is met with an impeccable cast, especially Mel Gibson who fits the role perfectly as does Barry Pepper as journalist Joe Galloway. The quality of We Were Soldiers is presented in 2.35:1 widescreen that has been flawlessly transferred to Blu-Ray and is pure eye candy, especially the majestic cinematography of Vietnam. With stunning audio quality, the overall transfer of We Were Soldiers is perfect and will impress all anacondas of this format. Featuring the exceptional commentary by Director Randall Wallace who truly takes you beyond the movie with his ideas and focus from the novel, add in a Making of Documentary and the special features nicely rounds up this first class presentation.